Retail giant Amazon continues to reign supreme in online shopping, this time surviving Mobilegeddon and being named as the most visible retailer on Google, both on desktop and mobile searches. The Seattle-based e-commerce company takes the top spot with a crushing margin of victory over other retailers. Easily topping Walmart and Home Depot, Amazon came out on top in terms of Google searches via desktop PCs, according to a research conducted by Searchmetrics. The study also shows the brands that lead in desktop searches also perform well in mobile phone searches on Google.com and in the wake of the recent mobile-friendly update. The research took the top 10 online retailers in the National Retail Federation’s top 100 retailers list and analyzed the search results of millions of Google search terms to come up with a visibility score for both desktop and mobile searches. Amazon led the pack with a mobile visibility score of 11,145,359 and a desktop visibility score of 11,351,308. Walmart comes in at the #2 spot, with a mobile visibility of 1,816,192 and a desktop visibility of 1,819,900, while Home Depot claims the third spot with a mobile visibility of 881,538 and 866,995 in desktop. Target and Lowes round out the Top 5. “Our study broadly finds that those sites that are highly visible in desktop searches also perform well in mobile phone searches,” said Searchmetrics founder and CTO Marcus Tober. 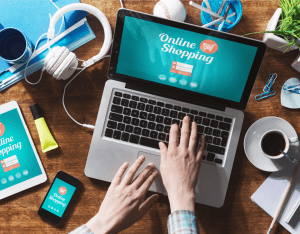 The visibility scores show us mobile goes hand-in-hand with desktop when it comes to online shopping. Users still regard mobile as their first touch point to buying, leaving the final process of the purchase to desktop. Now that Bing will release its own mobile-friendly algorithm and several networks such as Instagram and YouTube are improving their ad platforms, it’s high time you optimize both your mobile and desktop presence. As what Tober said, working hard to optimize your sites and making sure these are mobile-friendly will do a lot in improving your presence on mobile and PC, especially for small and medium businesses.